If you follow me on Instagram, then you know that we are in the middle of a big renovation at our house. The work is mainly in our kitchen, but spilling over to a few other areas of our home. So, we have been living in what can only be described as slightly-organized chaos. The upside to this (other than finally getting some much needed updates) has been that I've been "forced" to sit in one room for a lot of the day. I can't clean, do laundry, or cook. But I can watch. And, to be honest, it's been wonderful. Typically, I don't have as much time as I would like to just sit and observe Augustus at play. Life gets in the way more often then I would like. So, to have the time to just sit and watch him has been a welcomed gift. 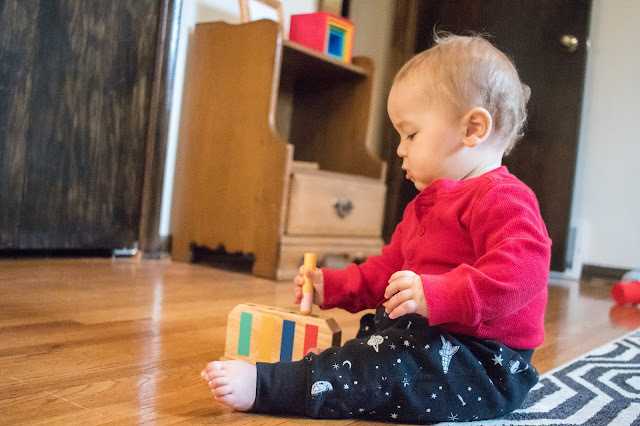 Observation is so important in any Montessori environment. It's through observation that we see just what our children's interests are, how they solve problems, and the joy that they get from work. We have to take time to observe so that we understand what they need from their environment. This is how we know what changes we need to make. Understand that there is value in everything your baby chooses, even if it seems like he/she is wandering or just running around. Don't interfere -- at all -- unless something is unsafe sit back. This includes praising your child. Don't rush to help! 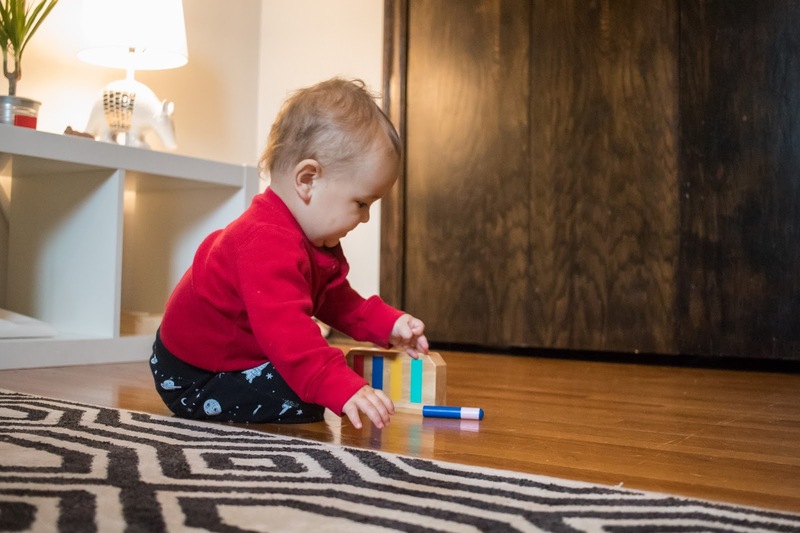 This is a hard one, let your baby experience frustration and work out a solution, even if it means sitting on your hands to prevent interference. 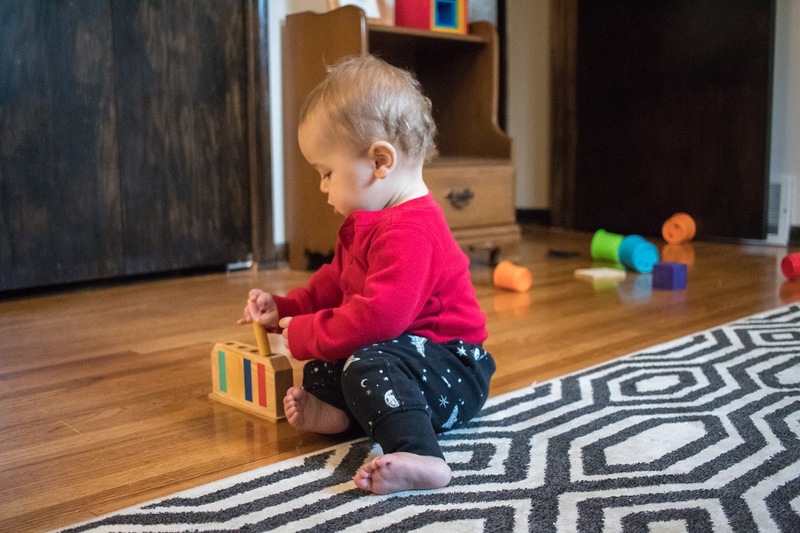 Look deeply -- don't just say "Gus is playing with the Pop Up Toy" but notice what your child is doing, how is he/she sitting, how are his/her hands moving, what is he/she feeling? Notice if the environment is meeting your child's needs. Does something need to be changed? Can your child access what he/she needs? What changes can you make to meet your child's needs? Observing your baby doesn't start when your baby is Gus' age. Start at birth, make the time, as hard as it can be. No matter the age of your child, observation is key to understanding where your child is, and what they need from you. Do you take time to observe your baby? I love this! It's something I've really worked to cultivate with my daughter. I'd love to know: how do you practice this best when your child is in the 18-20 month range? My daughter is currently here and it seems like she has a hard time settling into play unless I am in the room. I can do handwork or read, but otherwise she wants to follow me around the house doing what I'm doing. She also has a tendency to ask me lots of things and engage with me...is it best to quietly validate? try to remind her that I am reading and she can play? engage her in the activity she is offering? I'd love to hear your thoughts! thanks!